This week’s BEACON Researchers at Work blog post is by University of Idaho postdoc Jessica Audrey Lee. Greetings, BEACON fans. I’m writing from beautiful Moscow, ID, where I work as a postdoctoral researcher in the Marx Lab at the University of Idaho, and where our incubator smells like a cookie factory. It smells that way because the model compound we’re working with at the moment is vanillin, which is not only an important substance in the global food and fragrance industries, but is also a key intermediate in the microbial degradation of lignin. Oenophiles (of which I am one) may already know this: vanilla-like flavors in wine are almost always a sign that the wine has aged in oak barrels, because oak wood, with its high lignin content, flavors the wine by releasing aromatic bits and pieces of that lignin into it. Foodies (of which I also am one) may also already know this: more than 99% of the vanilla flavoring used today doesn’t actually come from Vanilla planifolium (the vanilla orchid, the source of “real vanilla extract”), but instead is produced industrially either from fossil fuels or from chemical processing of lignin (Walton et al., 2003). And biofuels researchers also know that vanillin (and its derivative, vanillic acid) can be used as a decent stand-in for the monomers that make up the very complex polymer that is lignin. My current research is part of a larger project, with collaborators at BU and LBNL, to create a microbial consortium for degrading lignocellulosic biomass (that is, assorted plant parts, some of them woody) into fatty acids that can be used as biofuels. Our consortium will include some of the usual suspects—bacteria from the well-known soil-dwelling genus Streptomyces, and the fatty-acid-accumulating yeast Yarrowia lipolytica—as well as a more unusual player, Methylobacterium extorquens. This Methylobacterium species is typically found on plant leaves—not in the soil, degrading dead plant matter—but we’re introducing it to our consortium because it has a special talent: handling formaldehyde. Lignin is a difficult compound to degrade, and one of the reasons it’s difficult is that it contains a great number of methoxy (-OCH3) groups. The typical microbial approach for dealing with these methoxy groups is to remove them and turn them into formaldehyde, but the subsequent process of detoxifying the accumulating (very toxic!) formaldehyde can severely slow down lignin degradation (Mitsui et al., 2003). Happily, Methylobacterium, because it typically eats methanol for a living, is very efficient at processing formaldehyde as a metabolic intermediate, so if we could just get it to pull the methoxy groups off of the lignin monomers we could potentially make significant gains in biofuel production from lignocellulose. 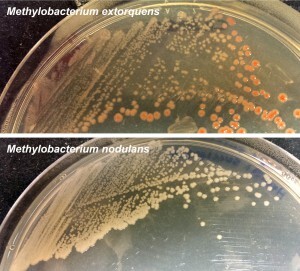 M. extorquens (and most Methylobacterium species) carries pink sunscreen-like pigments. M. nodulans, adapted to living in the dark, is white. This is where the evolution and ecology get interesting. Methylobacterium is in the order Rhizobiales, and therefore not too distantly related to some other plant-associated bacteria that have been shown to degrade lignin, for instance Bradyrhizobium japonicum (Sudtachat et al., 2009) (which can often be found in plant root nodules). In fact, if you compare the two genomes at the locus of the B. japonicum vanillate-demethylating genes (vanAB), you’ll find that all Methylobacterium species also have a gene that looks similar enough to be part of the same pathway (I call it vanA-like). Sadly, M. extorquens can’t demethylate vanillin (hey, it was worth a try—it’s possible we’re the first lab that ever bothered to ask). However, we’ve found that it has a close relative, M. nodulans, that can! We’ve located the M. nodulans gene cluster that we think is responsible, and it seems to have nothing to do with the vanA-like gene that I mentioned earlier; it’s located far away in the genome and doesn’t resemble anything that any of the other Methylobacterium species has (as far as I can tell). What’s even cooler is that M. nodulans is the one species of Methylobacterium that lives not on leaves but in nodules on plant roots. So I suspect that lignin degradation might be a talent it retains specifically because it’s useful in the soil environment. We’re likely to follow up cloning with evolution in the lab to help M. extorquens get used to its new genes… and when we do, what kind of changes can we expect to see? I’m new both to experimental evolution and to the metabolism of aromatic compounds, so I have a great deal still to learn. I’m looking forward to finding out more about the evolution has happened in the environment to separate M. nodulans and M. extorquens on the plant, and the evolution that will happen soon in our lab, on the way to creating a microbial consortium for biofuel production. Mitsui R, Kusano Y, Yurimoto H, Sakai Y, Kato N, Tanaka M. (2003). Formaldehyde Fixation Contributes to Detoxification for Growth of a Nonmethylotroph, Burkholderia cepacia TM1, on Vanillic Acid. Appl Environ Microbiol 69:6128–6132. 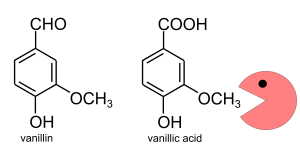 Sudtachat N, Ito N, Itakura M, Masuda S, Eda S, Mitsui H, et al. (2009). Aerobic Vanillate Degradation and C1 Compound Metabolism in Bradyrhizobium japonicum. Appl Environ Microbiol 75:5012–5017. Walton NJ, Mayer MJ, Narbad A. (2003). Vanillin. Phytochemistry 63:505–515. For more information about Jessica’s research, you can contact her at jessicalee at uidaho dot edu. This entry was posted in BEACON Researchers at Work and tagged bacteria, BEACON Researchers at Work, bioengineering, biofuels, Biological Evolution, genetics. Bookmark the permalink.